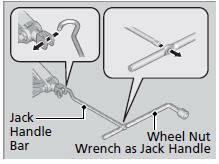 Place the jack under the jacking point closest to the tire to be changed. 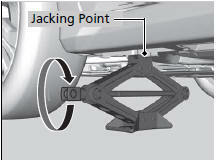 Turn the end bracket clockwise as shown in the image until the top of the jack contacts the jacking point. ► Make sure that the jacking point tab is resting in the jack notch. Raise the vehicle, using the jack handle bar and the jack handle, until the tire is off the ground. WARNING The vehicle can easily roll off the jack, seriously injuring anyone underneath. Follow the directions for changing a tire exactly, and never get under the vehicle when it is supported only by the jack. Do not use the jack with people or luggage in the vehicle. Use the jack provided in your vehicle. 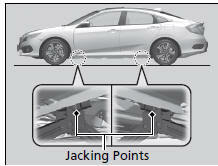 Other jacks may not support the weight ("load") or their shape may not match. Do not use while the engine is running. Use only where the ground is firm and level. Use only at the jacking points. Do not get in the vehicle while using the jack. Do not put anything on top of or underneath the jack.